Volatile Corrosion Inhibitor (VCI) Packaging is an effective way to prevent corrosion on metals. 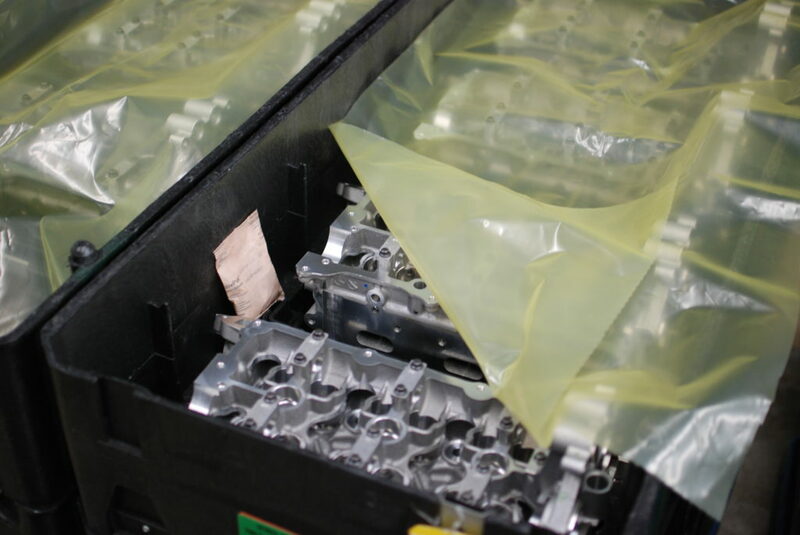 When packed correctly, VCI packaging can protect clean metals for years in shipping and storage. Typical VCI packaging products are VCI poly sheeting, VCI bags, VCI Kraft paper, and other VCI wraps. These packaging products are used to line containers or create enclosures around metal parts and equipment. They diffuse volatile corrosion inhibitors that settle on metal surfaces and form an invisible protective layer from rust and corrosion. They also protect from exterior contaminants such as moisture and dirt. One way to determine if additional VCI protection is needed is ask the question, “Does the VCI packaging or emitter have line-of-site?” Meaning can the metal surface be “seen” by the VCI? If not, additional VCI could be needed to effectively reach the surfaces. Even though VCI is a vapor and will travel and fill the void spaces in an enclosure, it can be difficult for the chemistry to travel long distances and effectively protect divided areas. The right amount of protection and best combination and placement of VCI products can be determined with the help of your Zerust Account Manager. Samples and testing is available to verify the correct packaging design to protect your metals parts.